The aim of this site is to create an insulinoma community, raise awareness and to provide up to date, easily accessible information. To date, most of the information on insulinomas is grouped with other rare neuroendocrine tumours. This site will provide a unique platform by bringing together information on this rare condition in one place. We recognise that many visitors to this site will be outside the UK. Everyone, wherever you are from, is welcome to share your personal experience of an insulinoma. Join a worldwide community of people who have been diagnosed with an insulinoma and find out more from their experience by joining our Facebook Group. Even the smallest tumours can cause symptoms connected to hypoglycemia (the medical term for low blood glucose levels). The vast majority are benign (with no spread beyond the pancreas). However, 10% are malignant and by the time of diagnosis will have spread elsewhere in the body, usually the liver. The tumours are generally diagnosed in middle age and slightly more women are affected. If an insulinoma is suspected you may also be screened for a genetic condition called MEN1. What are the symptoms of an insulinoma? How can insulinomas be treated? This book provides a greater understanding of insulinomas and contains information about symptoms, diagnosis and treatment. 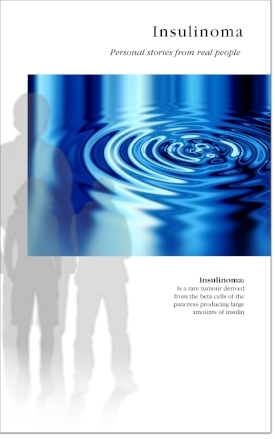 The book is written by real people with an insulinoma who wanted to share their story about having the condition. It is written in their own words and in their own voice. It is dedicated to the memory of Te Rina Lyttle who died at the age of 15 years old from a malignant insulinoma in April 2012. Download as PDF or as Kindle e-book. Copyright and Content: Content on this site has been sourced from the NET Patient Foundation that supports people diagnosed with neuroendocrine tumours and their families.